The much awaited trailer of our friendly red demon of B.P.R.D. second movie The Golden Army soon to be released this coming July 11 in theaters worldwide under the direction of Guillermo Del Toro. 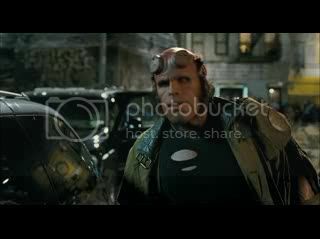 Hellboy (Ron Perlman) is back in this sequel of the movie adaptation of Mike Mignola's graphic about a demon turned paranormal investigator. Together with HB are the Pyrokinetic Liz Sherman (Selma Blair), the empath Abe Sapien (Doug Jones) and Johann Kraus (John Alexander) the mystic now fighting side by side against the forces beyond reality and fantasy. It seems that we are having a long trail of comic book movies this summer starting with Iron Man, Incredible Hulk, Hellboy II and The Dark Knight. This summer is indeed hot for the comic book geeks.